Don't let the documents you no longer need end up in a landfill, when Planet Waster Services can properly dispose of your waste. 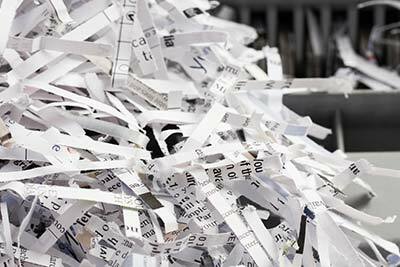 We offer secure confidential Shredding services. For businesses that need to follow privacy legislation or prevent data breaches, secure shredding and hard-drive destruction is available. We collect shredded paper for packing material, animal bedding, and compost. Otherwise, shredded paper can be bagged and put into the garbage. We handle all types of confidential documents such as legal and corporate documents, and medical. We will make sure that all documents are 100% destroyed in a timely and organized matter putting your mind at ease in keeping sensitive information and privacy intact. Give us a call today to learn more about our Shredding services.